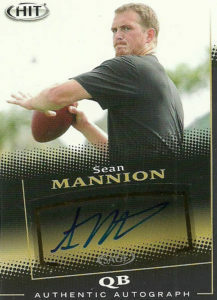 Sean Mannion was a prolific passer for the Oregon State Beavers from 2011 to 2014. Holding many of the Beavers and Pac-12 passing records, Sean finished with 13,600 yards on 1,187 completions of 1,838 attempts, and 83 touchdowns. He was selected in the 3rd round of the 2015 NFL Draft by the then St. Louis Rams. Since that time he’s spent the entirety of his career as a backup. He’s seen spot duty here and there behind first Case Keenum and Nick Foles, and then in 2017 as the primary backup behind Keenum and Jared Goff. He got to start his first game in 2017, the season finale- a 34-13 loss to the 49ers. While the Rams notched a loss, Mannion did his best throwing for 169 yards on 20 completions and no interceptions.